Treachery. Madness. Murder. The story of Hamlet has been told for 400 years…but it's never been told like this! 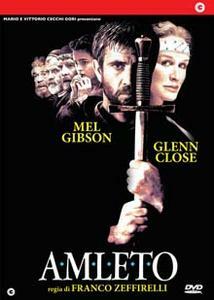 Mel Gibson (the Mad Max and Lethal Weapon films) takes on his richest part to date, the title role in a dynamic new version of Shakespeare's Hamlet. Directed by Franco Zeffirelli (Romeo and Juliet, Jesus of Nazareth), the location-shot production has a sumptuous look that won Academy Award nominations for Art Direction and Costume Design. Gibson plays the prince of medieval-era Denmark, who senses treachery behind his royal father's death. Glenn Close (Fatal Attraction, Dangerous Liaisons) plays Hamlet's mother Gertrude, all too dangerously entangled in that treachery. A brilliant supporting cast, including Alan Bates as Claudius, Paul Scofield as the ghost of Hamlet's father, Ian Holm as Polonius and Helena Bonham-Carter as Ophelia, adds its powerful presence to this immortal tale of high adventure and evil deeds. Big, bold and heroic, this is a vivid and virile Hamlet for the modern age and all time. Intervista, trailer originale, biografia del regista e degli attori principali. Interview, original trailer, biography of the director and the principal actors.